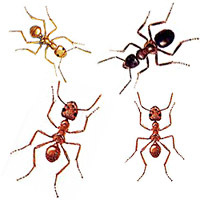 Ants can be found almost everywhere, except probably at the polar caps, but you never know there may be a species of Eskimo Ant. Anyway, there are something like 15,000 known species of ant which have been described, and these are adapted for widely varying conditions. Common to them all, however, is the fact fact that they are all social. Technically speaking, they all belong to the Superfamily Formicidea of the order Hymenoptera and there are about 47 British species. There are carnivorous, herbivorous and omnivorous species, but in a lot of species their favourite food is honeydew, which they milk from Aphids, which has a high sugar content. When an ant finds a food source it will lay a pheromone(scent) trail back to the nest, where it will communicate with other workers by tapping antennae and also giving some of the food from it's crop, these workers in turn will then be able to locate the food. So when you spill sugar or a sticky drink in your kitchen or living room now you know why suddenly there's lots of ants about. Any problems just click the mail link below and let me know...!